Muffled rock music emanates from a small, dilapidated rehearsal studio in Lynwood, Calif. Inside are four young musicians, hailing from suburban southeast Los Angeles, rehearsing for their metal band Blakk Widowed. The scent of a freshly lit cigarette parades from the wall of mirrors to the wall of curtains over the four-member metal group’s tangled wires and sweat stains that cover the floor. Drummer Kumar Gutierrez’s first set of drumsticks was a plunger handle and a novelty pencil. 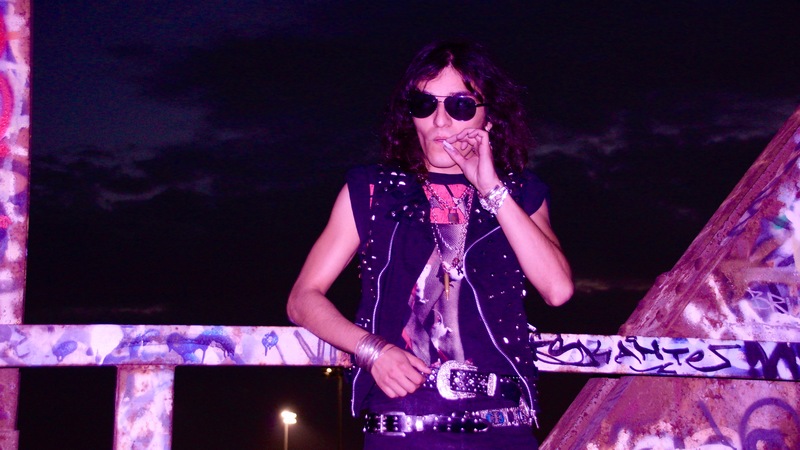 The vocalist, Alejandro Hernandez, avoided metal bands throughout his youth. The bassist, Rony Valdez, would stay out late despite his mother’s scolding. The guitarist, Edwhin Rokkett, well, he started his own band. Bläkk Widöwed — (Left to right) Guitarist Edwhin Rokkett, drummer Kumar Gutierrez, vocalist Alejandro Hernandez, friend of the band Adbrien Jimenez, and bassist Rony Valdez pose for a group portrait on abandoned railroad tracks at the L.A. River. Together, they are Bläkk Widöwed, — four young Mexican American Angelenos bred in the shadow of the Hollywood, hoping to “make it.” Artists around the world convene in the city of angels to pursue their music dreams, but Bläkk Widöwed strives to achieve success with their authentic flavor. Edwhin Rokkett was dissatisfied with the style of Fright, his previous band, so he chose to start his own. He spread the word and contacted everyone he knew. The first person Rokkett asked to join him on his new musical endeavor was Rony Valdez. They met in high school when Valdez was a freshman and Rokkett was a senior. When Valdez entered his senior year, Rokkett told Valdez he wanted to do something to fit his taste. “I didn’t even start playing bass until this foo was like, join my band,” Valdez said. So, he did join the band. Kumar Gutierrez, Bläkk Widöwed’s drummer, introduced him to a bassist who taught him how to play. Alejandro Hernandez met Rokkett at the Whisky a Go Go three years prior, but they weren’t good friends until Hernandez contacted Rokkett to try out. Rokkett’s new vision was coming to life. All he needed was a drummer. Gutierrez was interested in Rokkett’s new band and Rokket was interested in Gutierrez’s drumming skills. The musicians first practiced together in August 2017. Gutierrez recalled a friend who let them borrow a studio so they took advantage of the opportunity and “jammed out to their heart’s content,” as he said. The vocalist — Alejandro Hernandez, 23, sings vocals for Bläkk Widöwed and his favorite song is their ballad, “Gone By Tomorrow” because it’s different from most of their songs, drawing in the audience’s attention towards the end. They were discussing potential band names and agreed Mötley Crüe’s song, “Black Widow” is underrated. Gutierrez knew the name was perfect. “We just f***ing love that song so much. We love Mötley Crüe, we love the song,” Gutierrez said. They stuck with the name for good. Valdez said he feels the band name fits perfectly because Mötley Crüe is one of their main musical influences. “We have a distinct sound so the name follows every genre we play. It’s weird, I can’t describe it. It’s a cool feeling,” Valdez said. Edwhin Rokkett, 21, plays guitar for Bläkk Widöwed and his favorite song is their instrumental, “Widow Maker,” because the rifts make it heavy enough for his liking. The musicians are proud of the performances they’ve given within the last year. The band claims their own sound — a mix of different genres to not bore their listeners. They express their creative freedom without the fear of being shamed for it. It’s their art. Since their first performance at the Watts Cave in December 2017, they’ve played around 20 gigs, from South Gate’s Shenanigans to downtown L.A.’s Five Star Bar to Hollywood’s Rainbow Bar & Grill. “I think it’s cool [that] we’ve already had all these many shows and neither of us had jammed out with each other musically before,” Valdez said. Each member brings a different element to the band’s feel, even though they were 1980s influenced. “You can definitely hear the influences in our music, but as songs all put together, I think it sounds way different,” Gutierrez said. Kumar Gutierrez, 24, plays drums for Bläkk Widöwed and his favorite song is “Asylum” because though it’s unusual, it fits nicely, he said. The demo will be a four track EP, to be released in August. The demo is in its final stages of mastering. The members won’t sell the CDs but hand them out for free and pay for delivery if their foreign audience wants a copy too. The demo will be distributed on multiple online platforms including YouTube and Bandcamp. They hope this brings them a step closer to signing a record label. Rony Valdez, 18, plays bass for Bläkk Widöwed and his favorite song is “Speeding Through The Night,” because he “feels the vibes” every time he plays it. “It’s like an adrenaline rush,” he said. The musicians each have different ideas of “making it” in the city of Los Angeles, taking advantage of the fact that aspiring artists travel to the entertainment industry in search of fame and glory, but they’ve been surrounded by it all their lives. Rokkett dreams to play at stadiums, land a good record label, and make a career out of doing what he loves. Hernandez plans to leave a legacy, because that’s the beauty of “being dead for [so] long that people still talk about you, to always be remembered,” as he said. Gutierrez would like to provide for his family, but understands they may not “make it,” so he’ll leave good music to be remembered by. His high school friends attend Bläkk Widöwed’s performances so he’s grateful for their support.